A MEMORIAL to the men and women of Kildare who served and died on the battlefields of World War I was unveiled during an atmospheric ceremony at Áras Chill Dara in Naas on Sunday morning. 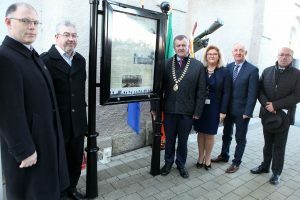 The memorial was unveiled by Mayor of Kildare Cllr Seán Power on 11 November – 100 years to the day of the armistice which brought hostilities to a halt – at the archway and clock tower building of the former Naas military barracks, through which thousands of Irish soldiers marched headed for Europe and the Middle East. Many did not return. “Today, we remember and pay tribute to the men and women who sacrificed their lives, and the families left behind whose loss was insurmountable,” Mayor Power said following a minute’s silence to honour the fallen. Organised by Kildare Co Council and the Co. Kildare Decade of Commemorations Committee, the moving event concluded with a civic ceremony in the Osprey Hotel. Soldiers’ letters alongside poems and songs were performed to a rapt audience that included family members of those who fought in the war, set against a sombre backdrop of archival footage depicting Irish soldiers and the Battle of the Somme. A commemoration ceremony also took place in Athy on Sunday.